The creative artist in conflict with a destructive external pressures and corrosive internal tensions is a recurring theme in David Pownalls meticulously crafted plays. 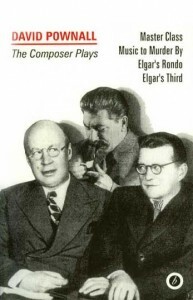 In his world-wide success, Masterclass, composers Shostakovich and Prokofiev find themselves confronted by the dictator, Stalin, to be told that their music is corrupt and that they must “sacrifice their individuality to the needs of the state; in Music to murder by the 20th century composer Peter Warlock summons up the 16th century madrigal composer and wife-killer, Carlo Gesualdo, to persuade a critic that all must be sacrificed to the music; Elgar’s Rondo, First produced by the Royal Shakespeare Company, captures the depth of the great composer’s depaor as he wrestles with the growing feelings of artistic failure; and the tragic Elgar's third, for the radio, illuminates the composer’s final losing battle to write a third symphony in the face of impending death. In these acclaimed “composer” plays Pownall shows how the power of music shapes and changes lives, politics and history. Absorbing to read as well as to see on stage.